Amsterdam spreads out of the Amsterdam Centraal railway station and Damrak. The oldest area of the city district De Wallen with the famous red light lies to the east of Damrak. The old Jewish quarter is located to the south of that area. The main business and financial center lie at the districts Jordaan and de Pijp. The heart of the city is crossed by the world famous canals or, as they are called here, grachten. 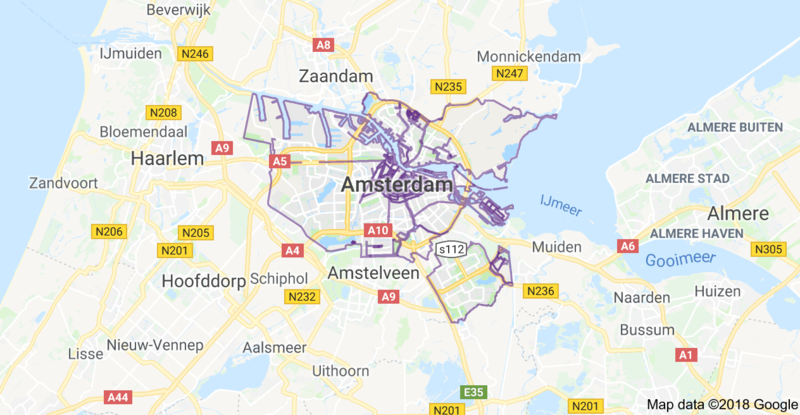 All cultural and historical districts as Museumplein, the Vondelpark, the Plantage neighborhood are located outside of the Grachtengordel. At the basis of the Grachtengordel area lie tree canals: the Herengracht, Keizersgracht, and Prinsengracht. The fourth canal Singelgracht lies within the outer ring and therefore is often not mentioned on maps. The plan of the canal placement is based on four concentric half-circles of canals.